Greg and I were already back to meetings on Friday and by Wednesday the little munchkins will be back in our classrooms, slouching in seats and waiting for their brains to be filled with knowledge. Our long, lazy summer mornings are officially a thing of the past and that means we need to up our breakfast game- we're talking fast and we're talking yummy. June's an oatmeal fanatic so Greg and I have ended up eating more oatmeal than ever- it's easier to just eat whatever June is eating (We draw the line at breast milk though). With our crazy frantic mornings on the horizon I've got a trick or two up my sleeve to make preparing June's breakfast (and mine and Greg's) easier than ever. 2: If making for baby, blend oatmeal. A friend gave me her baby bullet (thanks Sarah!) and it has been the best kitchen gadget ever. If you don't have one or a blending device that does smaller portions I highly suggest it. It's a dream. We blend everything of June's. 3: Add fruit. Here you can go one of two ways. You can add raw fruit, and in that case just throw the fruit in the baby bullet with the oatmeal. Great raw fruits to add to oatmeal are bananas, strawberries, blueberries, and raspberries. If you really want to go nuts you can combine a few fruits. June goes absolutely nuts when I give her banana blueberry oatmeal. She thinks she's died and gone to heaven with that stuff. You can also add steamed fruit. Steamed fruits that go really well with oatmeal are peaches, pears, and apples. Steaming only takes ten minutes or so. (Apples take closer to 20 minutes.) Obviously there is no way I have 20 minutes to spare on school mornings, but I often will steam fruit at night while making dinner or sometimes on weekends I do a huge batch of steamed fruits and veggies to last June through the week. It really is so much more healthy than baby food and so much tastier for June too. Not to mention that it is so much cheaper than buying prepacked baby food. 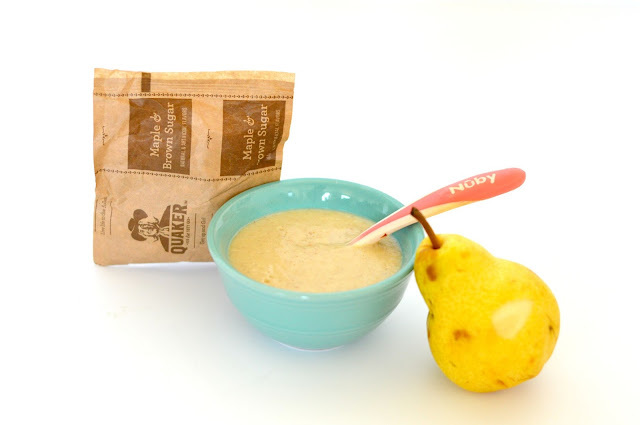 I will often have steamed pears or apples in a jar in the fridge and so at this point I just throw those in with the oatmeal and blend it up for a few seconds. This morning I threw apples and pears into the strainer while I unloaded the dishwasher. Ideal for weekends but not for busy school mornings. 4: Blend fruit; mix oatmeal and fruit. Again, I just throw everything in the baby bullet. It is worth its weight in gold, I tell you people. and the other part I added to June's oatmeal this morning. Oatmeal + pears + cinnamon = June loves me forever. ***Side note: This recipe is also great for adults. I do the exact same thing for Greg and me that I do for June minus the blending. I usually put cut up bananas with my oatmeal and Greg prefers nothing but brown sugar. ***Side note2: Don't be intimidated by steaming fruits. It really is so easy. I often do a huge batch on Saturday, put some in the fridge and freeze a bunch in little plastic bags. Defrosting the blended fruit takes just a minute or two- exactly how long as it takes the oatmeal to cook. It really is so easy. I promise you on this one. Quaker Chewy Dips Chocolate Chip. 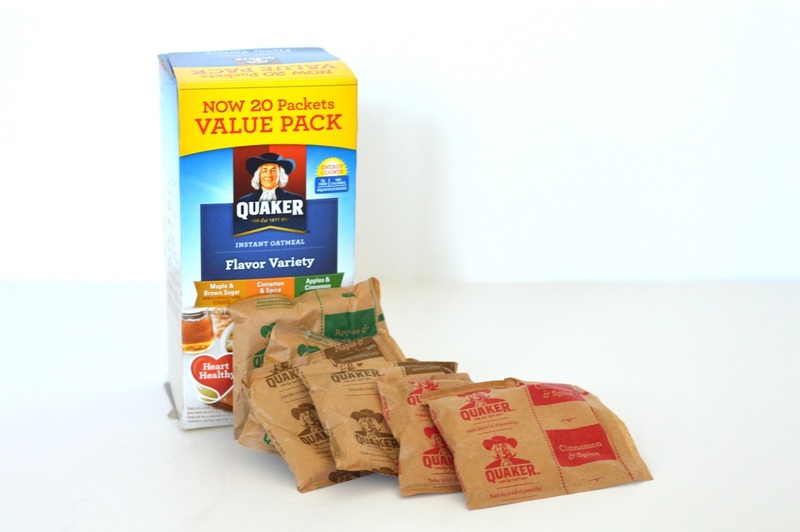 For more breakfast recipe inspiration make sure to check out Quaker on facebook and twitter.